Wondering what types of careers might be a good fit for your skills? Or need a better way to describe your skills on a resume? and strengthens your skills awareness as you plan next steps for your career. How does the Skills Matcher work? You rate your levels on 40 key workplace skills, then get immediate results: a list of careers that are good matches for the pattern of skills you identified. It typically takes between 10-20 minutes to complete. You can expect to see results that include some great career ideas, some surprises, and some options you aren’t interested in, based on factors other than the skills required. From there, you can explore the careers on your list of matches. You can learn about average pay, typical education, and the outlook for job opportunities in that field. If you want to dive in to more details, you can follow links to full career profiles in CareerOneStop’s Occupation Profile. The Skills Matcher is based on skill and knowledge data generated by the U.S. Department of Labor occupational information source, O*NET. The tool uses a statistical formula to compare users’ own skill ratings to the knowledge, skill, and ability ratings associated with more than 900 occupations. What can I learn from my list of career matches? 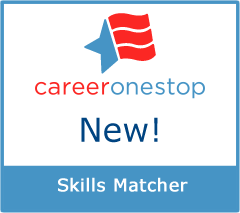 You can use your list of occupation matches to explore career ideas that may be right for you. You can also download or print out a list of the skills you rated highest to use for developing your resume and cover letter, or to help you prepare for job interviews. Annual wages: See the median salary for each career. Median wage means one half of all workers in this occupation earns less than this wage and one-half earns more. Education: See the level of education usually needed to enter this career. Outlook: Indicates whether the career listed is expected to be in demand. You can choose to see only career matches that fit your education and experience level. You can sort your list to check out the highest-paying or fastest-growing careers in your matches. If you aren’t satisfied with your matches, you can revise your ratings and receive different results. You may want to give lower ratings to skills you have, but prefer not to use in your work, such as fitness activities or hobbies.